The multi-talented Kirk Thatcher got his start at a very early age designing, building, painting and performing for George Lucas’s Industrial Light and Magic. Working for himself with David Fincher, he did concept and design work on several rock videos, was then hired by Leonard Nimoy to associate produce (and perform a cameo in) Star Trek IV and landed at Walt Disney Imagineering, working on character design and theme park ride development. While doing similar work on his own in the mid-1980s, a mutual friend introduced him to Jim Henson who asked him to collaborate on a number of projects starting in 1987. 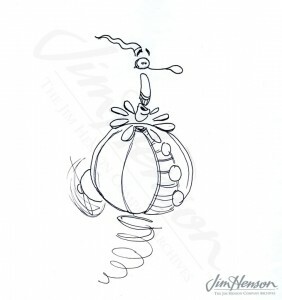 Kirk did some designs for an unrealized project called Muppet Voyager, but was really recruited to work on the characters for The Jim Henson Hour. 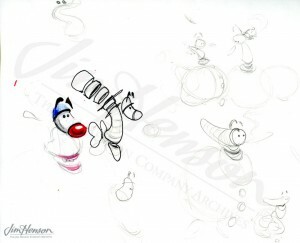 Kirk’s substantial design work for the show included the characters Clifford, Vicky and Leon, as well as the overall set design. 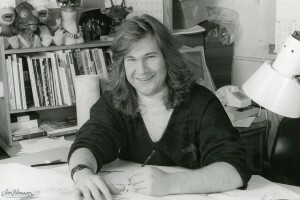 He collaborated with Jim on the storyboards for the opening sequence and provided designs for other characters throughout the series. 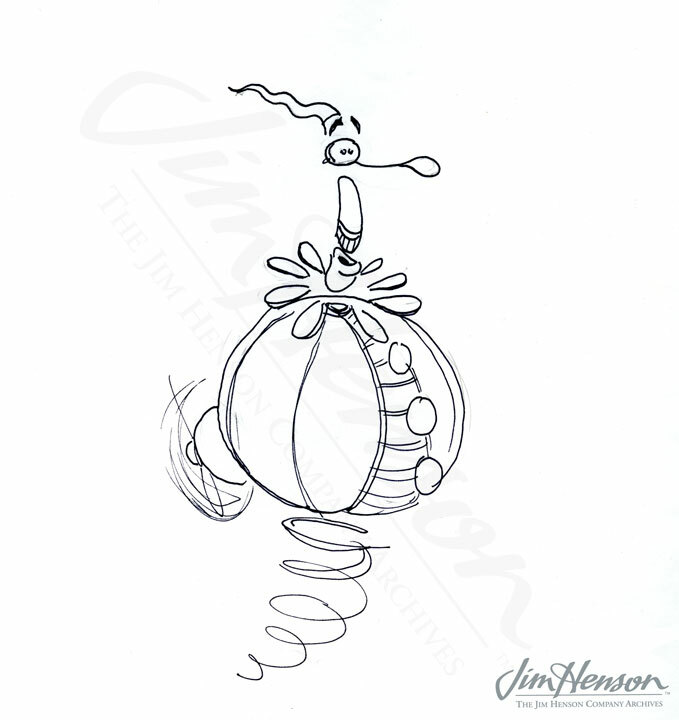 Perhaps most important was his work on Jim’s first digital character, Waldo C. Graphic. Around 1986, when Jim discovered that it would be possible to adapt his radio-controlled animatronic puppetry system that he had used so effectively for the fur and foam characters in Fraggle Rock to a computer-generated character, he was eager to try it. Development for The Jim Henson Hour moved forward over the next two years, and it seemed appropriate to include a digital puppet in an hour devoted to exploring a variety of stories and styles. According to the press kit, “The computer animated character [was] the result of an elaborate process developed at Pacific Data Images after much research, experimentation and head-scratching.” Both the software and hardware, developed with PDI, was combined with Henson puppetry to create the final footage. Steve Whitmire, performing Waldo C. Graphic, operated an elaborate armature rigged with electronic sensors to capture his motion. The data was sent to the Silicon Graphics Iris 4D/70GT where Waldo’s shape data resided. It was animated in real time and composited into the live shot that included actual puppets being performed at the same time. 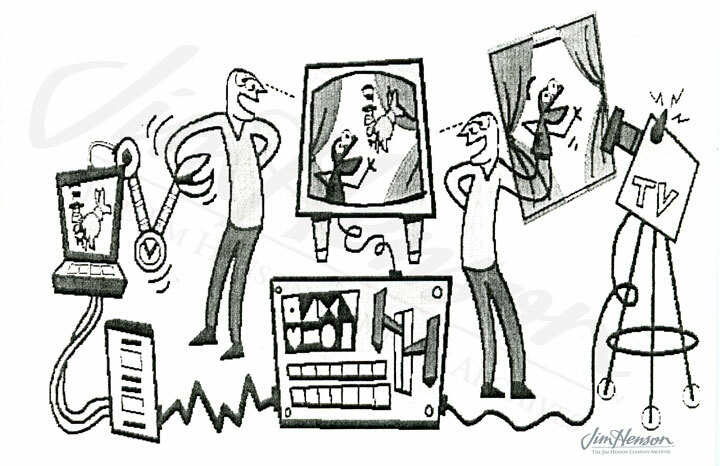 Both Steve and the other puppeteers used monitors to locate their characters in the scene and in relationship to each other. Additional rendering added Waldo’s color and costume changes to create the final images. Waldo was immortalized in 1990 as part of Jim’s Muppet*Vision 3D which continues to entertain delighted audiences at Walt Disney World and at Disney’s California Adventure. Advancements to this technology in recent years gave birth to the Henson Company’s Sid the Science Kid which features a whole community of digital characters performed in real time. Hear from Kirk Thatcher about his experience on the Henson.com Podcast. Jim Henson, with Rex Grignon from PDI, explains how Waldo works on The Jim Henson Hour episode “The Secrets of The Muppets”, 1989. Kirk Thatcher in the late 1980s. 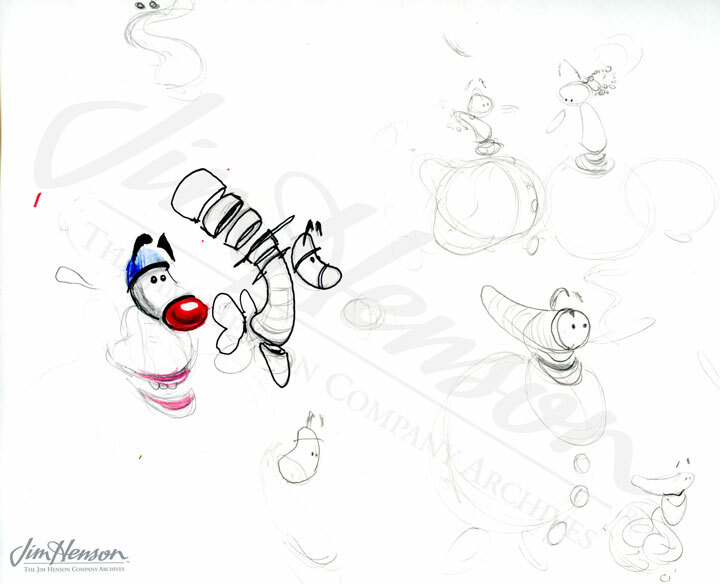 Kirk Thatcher’s design for Waldo C. Graphic for The Jim Henson Hour, 1988. 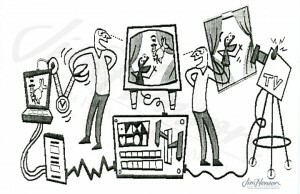 PDI’s cartoon showing one puppeteer performing the digital character while another performs a real puppet. This entry was posted in 04-April '88, 1988, Jim Henson Hour and tagged Disney's California Adventure, Kirk Thatcher, Pacific Data Images, Sid the Science Kid, Steve Whitmire, Waldo C. Graphic, Walt Disney World. Bookmark the permalink.